Thailand's Weather is best described as a tropical humid and dry climate. The north of Thailand has a dry season as well which is roughly from November through May. The south of Thailand has really only 2 seasons wet/rainy and dry. Even in the beginning of November it can still rain in Pattaya. Usually it rains for about 30 minutes but when it comes down it comes down. The sun chases away the rain afterwards. 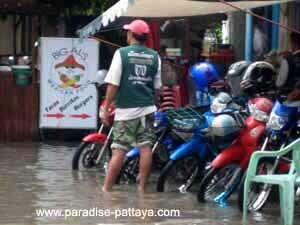 You can expect the Pattaya weather pattern to be unpredictable at times. Notice a few dark clouds on the horizon? I recommend getting your shopping done quickly. Once the clouds start coming over you it's a good time to stay indoors. It's even just about the downpours. Once the sun comes out again you'll be faced with flooded roads. In fact there's no way you'll be able to walk out without getting soaked. Even if you ride a scooter or a baht bus - you can expect some splashing. You can avoid that by checking the weekly forecast as part of your morning routine. You'll spare yourself the drenching and can take advantage of the sunny days! The ideal time to visit Thailand is between early November and the end of February. The Monsoon rainy season has passed, and temperatures range from 68F - 91F. Over Christmas and New year is the main high season and booking Pattaya Accommodation in advance is a good idea. During the Monsoon season the weather is uncertain and alternates between thunderstorms and clear blue skies. Notice how it extends from Naklua bay to Jomtien bay! Tourists from all over the world travel to Pattaya with increasing numbers of tourists coming from the former Soviet Union, Russia and East Asia. Pattaya weather plays a big role in this. During the Low Season months you'll have more rain but cheaper prices. During the High Season months you'll get better climate but more tourists. In fact - make sure you have a place to stay before it gets all booked up. If a condominium is what you're looking for then check out Expat Condos. You'll find a big variety of places to choose from. Check out some of the tour videos - it'll feel like you're already here!